Last week was very quiet, with just the TopCoder SRM 630 on Friday (problems, results, top 5 on the left). Egor has beaten the SRM-at-5am odds and won the round by just 1.02 points - congratulations! I was not brave enough to take part in the middle of the night, so I don't have any insights to share about the problems. On Tuesday, TopCoder SRM 629 has fulfilled two characteristic features of a good ICPC contest: nobody solved all problems, but each problem was solved by somebody (problems, results, top 5 on the left, my screencast). These properties are not as important for the TopCoder format, of course, since the score of a problem decreases with time, and thus even if several people solve all problems, they are still differentiated quite well. Two things made this possible: the easy problem had a very subtle trick, while the hard problem was just hard. The easy problem had a real-world statement: you have a rectangular hole in the ground, and want to cover it completely using several rectangular boards, placing each board in such a way that its sides are parallel to the sides of the hole. In order for the boards not to fall into the hole, you want to place the boards in such a way that all four corners of each board are not inside the hole and not on its boundary. Given the size of the hole and the sizes of the boards you have, what is the smallest number of boards you need to cover the entire hole? When a problem has a statement that relies on common sense instead of formal maths, one needs to formalize the statement before solving the problem. In this case, we need to formalize the "all four corners are outside the hole" part and the "covers completely" part. And the main trick is that those two are formalized differently: for all corners to be outside the hole, we need the height of the board to be strictly greater than the height of the hole (or the same for width), while covering the hole completely requires that sum of the widths of the boards is greater than or equal to the width of the hole (or the same for height). It was very easy to miss the "or equal" in the second formalization, and many competitors including the match winner K.A.D.R made that mistake. And because the formalization step is usually quite simple and boring, we're simply not used to looking for mistakes in that step - so even re-checking the solution won't help since one would compare the program to the formalized version of the problem in one's head, and find no discrepancies. The hard problem asked about a very simple thing: given N, K and MOD, calculate S(N,K) modulo MOD, where S(N,K) is the sum of all possible products of exactly K different integers, each between 1 and N. For example, S(3,2) = 1*2+1*3+2*3 = 11. It's not hard to come up with the following reccurrence relation: S(N,K) = S(N-1,K)+N*S(N-1,K-1) - it represents whether we take the number N into the product or not. However, N was up to 109, and K was up to 2000, so simply using that formula would be too slow. K.A.D.R has come up with a brilliant insight which I want to share with you. He has noticed that when we fix the value of K, S(N,K) is a polynomial in N. For example, S(N,1)=N*(N+1)/2=1/2*N2+1/2*N. It's not hard to prove by induction that S(N,K) is a polynomial of degree 2K. One might now start constructing this polynomial in order to find its value for the given N - but that is quite hard, too. What Iaroslav did instead was to simply compute the value of this polynomial in points 1, 2, ..., 2K: S(1,K), S(2,K), ..., S(2K,K) can be computed in O(K2) time using the above recurrence relation very easily. And computing the value of a polynomial of degree 2K in point N given its values in 2K points can be done using a standard interpolation algorithm in O(K2), too! Congratulations Iaroslav on this amazing solution and on winning the match! On Friday, the Google Code Jam became yet another major contest won by Gennady in 2014 (problems, results, top 5 on the left). The Code Jam's scoreboard has loosely followed the pattern of the recent Yandex contest: at the end of the competition, Gennady was in 3rd place behind Evgeny 'eatmore' and Ivan 'mystic'. However, as the system test results for the large inputs were announced, it turned out that they were both incorrect in their attempts at solving F-large, while all of Gennady's submissions stood and he won the contest. Once again, making sure that one's solution are correct paid off - congratulations! Second-placing Evgeny was really close to winning - the code he used for F-small looks good in general and should be able to solve F-large just as well - but his submission failed, indicating that he probably has some very small bug somewhere. Among the problems of the final round, I've enjoyed problem D the most. You have up to 100 different candies, and for each pair of candies you prefer one of them to the other. Your preferences are not necessarily transitive - you might prefer A to B, B to C, and C to A. You're trying to pick your most favorite candy by considering all candies one by one and comparing each candy with the "current best" candidate. It's not hard to see that the candy chosen to be the most favorite depends on the order you consider the candies in. For example, in the above triangle, processing the candies in order ABC will lead to candy C being declared the most favorite, while ACB will make B look like the best candy. Given the matrix of preferences, and one specific candy, can you make that candy your favorite by considering all candies in the right order? If yes, you also need to find the lexicographically smallest such order. Tourist has started the week in his usual fashion by winning Codeforces Round 260 on Friday (problems, results, top 5 on the left). He has participated in just 4 regular Codeforces rounds in 2014 - and he has won them all. Amazing consistency! TopCoder Open Algorithm Round 3B, like most TCO rounds, took place on Saturday (problems, results, top 12 on the left, my screencast of the parallel round). Twelve more spots in one of the most prestigious tournaments in competitive programming were given out. The problemset was destined to make the contestants very nervous :) The 500 problem did not require any sophisticated algorithms or ideas, but required a small insight and a lot of attention to detail. Most contestants tried to solve it - but just 4 contestants managed to solve it correctly (3 out of those 4 are in the top 12 to the left), while many top rated favorites had a bug in their solutions and failed. This problem also played a very important part for some people who didn't solve it, as they were able to challenge a lot of incorrect solutions and gain a spot in top 12 that way. The 1000 problem, on the other hand, had a really simple problem statement but required great combinatorial prowess. 4 out of 5 people who submitted it got it right, so it was a safe ticket to the TopCoder Open - provided you could actually get a solution that passes the example cases. Congratulations to wata on solving it very quickly and winning the round with a commanding margin! The problem asked to count the number of trees on the given vertices (at most 50) that share at least the given number of edges with one specific given tree. Can you do it? Finally, MemSQL Start[c]UP 2014 Final Round was held on Sunday (problems, onsite results, online results, top 5s on the left). The onsite round was for those willing to travel to the MemSQL office in San Francisco, and the online round was for the rest of us, using the same problemset. This time the problemsetters didn't worry that much about having easy problems in the set, so the first three problems all had a hundred thousand numbers in the input and required O(n) or at least O(nlogn) solutions. This has unexpectedly bitten the contestants using Java since two out of those three problems involved sorting hundred thousand integers - and it turned out that using Arrays.sort is not good enough, since it uses a deterministic quicksort algorithm and thus can be made to work in O(n2) by a specially crafted testcase. Sure enough, some contestants did come up with such testcase. Lessons learned: either shuffle the array before sorting using time-based randomness, or use Arrays.sort on arrays of objects, not primitives, since that version is not quicksort. The hardest problem was not solved, is still not solved by anybody in the problem archive, and I still have no clue how to solve it. You are given a rooted tree of at most 250 vertices, and each node of the tree is either a leaf or has exactly two children. Each leaf has a number associated with it. Two players, maximizer and minimizer, are playing a game by making turns in order. At each turn, a player must pick a node with two children that are both leaves, erase those leaves, and pick one of their two numbers as the number for the node. The game ends when just the root is left in the tree, and the score of the game is the number picked for it. Maximizer wants to maximize the score, while minimizer moves in the other direction. What will be the score if both players do their best? This week had two rounds, both on Friday. 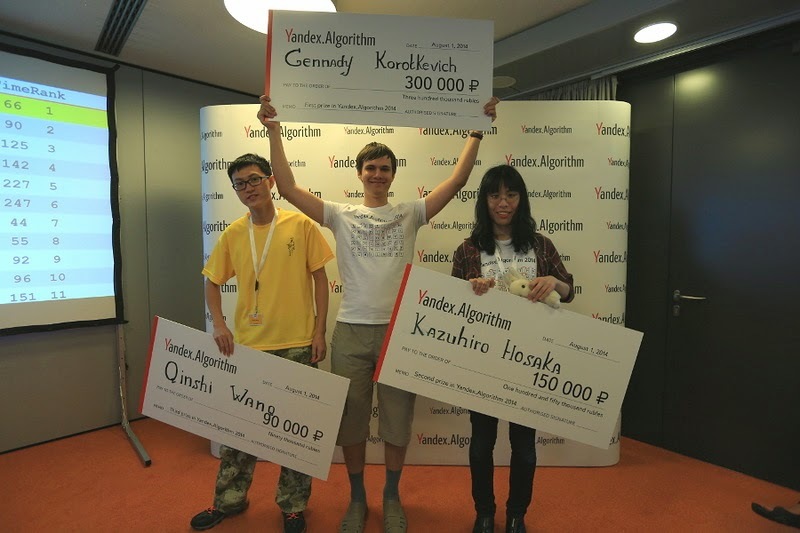 Yandex.Algorithm 2014 Final round (results, top 5 on the left) took place in Berlin, where 22 best contestants competed for the grand prize. I was competing there as well, and could have placed above tourist - had all of my blind submissions passed. Unfortunately, my solution for problem C turned out to have a very simple bug which I've missed in the end-of-contest rush, so I fell to the 7th place. It's probably even more disappointing for s-quark, who submitted problem C in the open and thus had several attempts to fix his bugs and claim the first place. Anyway, congratulations to Gennady! 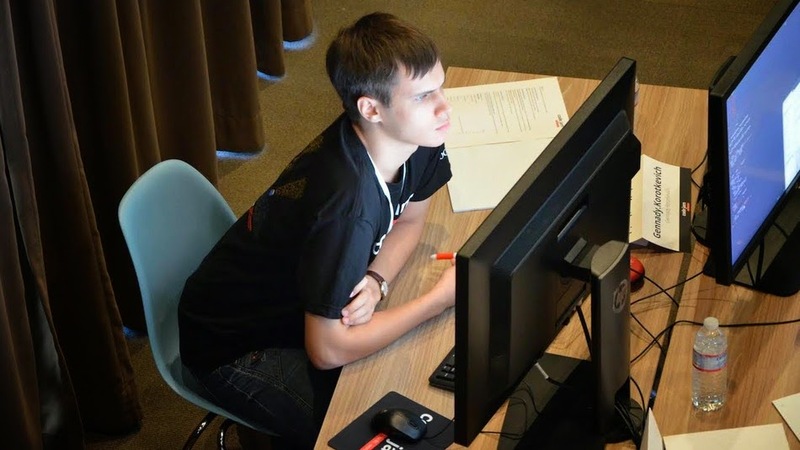 He has won all 2014 tournament onsites he has participated in: Facebook Hacker Cup, Kotlin Challenge, Yandex.Algorithm. Three more to go - Google Code Jam in August, Russian Code Cup in October, and finally the TopCoder Open in November. The picture on the left is from the official news feed. Amazingly, the problems were not too difficult. They don't seem to be public online. The four problems that were enough to win the competition were about sorting, backtracking, simple maths and quite standard Dynamic Programming. They did require a great deal of accuracy to get right, which was especially challenging given the open/blind format of the competition. Codeforces Round 259 (problems, results, top 5 on the left) thus became a bit of a consolutation round to me. Problem D which decided the round boiled down to the following nice Dynamic Programming subproblem: you are given 220 numbers. For each position i between 0 and 220-1, and for each distance j between 0 and 20, what is the sum of the numbers with such indexes k that k and i differ in exactly j bits? The time limit is 6 seconds. Thanks for reading, and see you next week! Last week, I've promised a detailed post on TopCoder Open Round 3A hard problem which had failed to materialize so far - but I still hope to publish it soon.